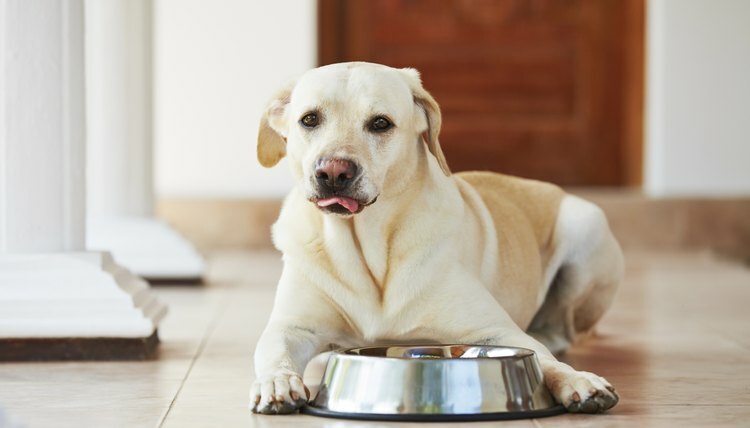 Picking the right ingredients for a homemade weight-loss dog food is essential: You want to make sure your dog is getting all the nutrients he needs to stay healthy and strong. Before settling on what ingredients to serve, discuss your intentions with your dog's vet. About 50 percent of your dog's diet should consist of lean animal protein, including skinless chicken or turkey, eggs, low-fat dairy products such as cottage cheese, and fish. Fish can be fresh or canned, but if you're feeding canned fish, make sure it has no added oil, as this can increase the calorie content considerably. Protein can be cooked or raw, but if you're cooking, make sure you're not using any oils, which increase calorie count. Try varying the protein so your dog is eating two to three types each week, making it more likely he'll obtain all necessary nutrients and prevent palate boredom. Dogs can lose weight eating non-starchy vegetables and whole grains, but grains cause allergies in some dogs, so start with small amounts and increase only if you notice no side effects. Puree cooked healthy veggies such as pumpkin, spinach, kale and other leafy greens, and mix them with the protein. They provide lots of fiber, which will help your dog feel full without adding tons of calories -- an excellent compromise for weight loss. To keep the calorie count low, steam, bake or boil all ingredients, either together or separately. A low-calorie, low-fat homemade diet has many benefits. Because you can control what goes into a homemade diet, you can make sure your dog is not getting additives and preservatives. You can prepare homemade diets to be free of soy, wheat, corn, dairy and high-fat meats such as beef. These ingredients are not only high in calories and sugars -- which means they contribute to weight gain -- but they can also cause allergies and a number of problems in dogs. Commercial diets have been designed to provide dogs with all the nutrients they need for good health. Homemade diets, meanwhile, run the risk of being deficient in certain nutrients, including zinc, vitamins D and E, copper and essential fatty acids. The only way to ensure that your pet is getting everything he needs is to talk to your vet and to make sure you feed a variety of foods of the highest quality possible.